Join TranscribeMe and monetize your downtime! | TranscribeMe! Join TranscribeMe and monetize your downtime! Transcribe audio and video into perfect quality text and get paid for it! It’s that easy. Take control of your own career today from the comfort of your own home. Choose the hours that fit your lifestyle. We offer the opportunity to be a part of our unique community and create lasting connections with professionals all over the world. All you need is a computer, a reliable Internet connection, and the ability to transcribe audio and video in any of the languages that we support. Join TranscribeMe now! Thousands of transcribers joined us already and started earning money by transcribing audio and video files. We are highly acclaimed by leading ‘work from home’ authorities for our intuitive platform, regular payouts and steady work stream all year around. To learn more about us, click on the images below. Our transcribers love their work! Our workers really enjoy being challenged and rewarded for their hard work. You will learn, grow and communicate with people from all over the world from the comfort of your own home. Stop wasting your time in traffic and start spending more time with your family today! Getting a job as a transcriptionist might just be the thing for you. Not only are you saved from cold calling only to have the door slammed in your face but also do you get to choose your own work timings. There’s no minimum amount of work that you can do. You receive a short audio micro-task, between 10 seconds and 1 minute in duration. When you’re done with it, our system sends you another micro-task to transcribe. There is no limit to how many micro-tasks you can process at one time. Work from where you want, whenever you feel like it and for as long or as little as you like. At TranscribeMe we believe in promotion from within. Our crowd transcribers enjoy their work and have career advancement opportunities as they progress. 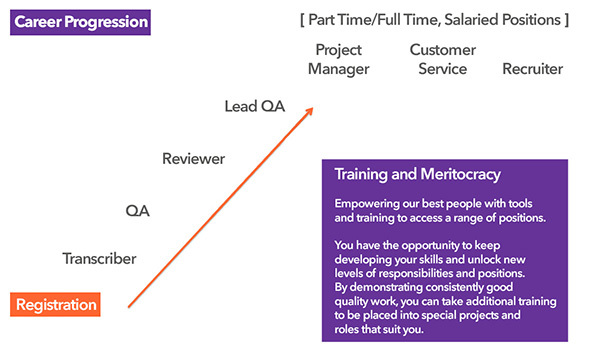 Develop your skills, grow and move up the career ladder to get into higher paying projects and positions. General transcription is where you’ll be starting from as it requires simply converting audio into text. Gain experience transcribing audio, move to editing and reviewing transcripts. You can rely on us! 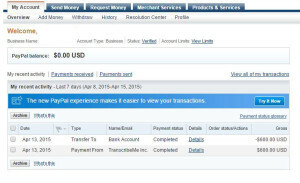 We pay regularly and securely via PayPal. Keep track of your earnings in real time and know exactly how much you have accumulated. Request your payment at any time and receive your money in $USD via PayPal for all the work you complete on a weekly basis. Get paid to learn! Broaden your horizons by working on variety of projects from a wide range of industries and learn something new every time you transcribe. Get an insight into various industries and boost up your resume to get back into the job market. No two jobs are ever going to be the same. TranscribeMe is more than just a job – it’s an experience! Become part of the Transcriber Watercooler community and start working in our global office today. Want to get the best travel tips in Thailand? Feeling like sharing a photo of your pet today? How about the best spot to watch the sunset in Australia? Interact with like-minded individuals from all over the world, every day. We are proud of having the friendliest community of professionals among crowdsourcing networks. Receive guidance, support and build long-lasting relationships. Want to become a professional in the field? We are here to help! Our award-winning transcription platform comes complete with full training modules and our dedicated training team nurtures your career development. Receive feedback on every assignment you complete and improve with every job you do. We will never leave you with unanswered questions; get as much support as you need and become a professional crowd transcriptionist with TranscribeMe! Why spend hundreds of dollars on buying outdated equipment? Joining us will not cost you a penny, since you are not required to buy any special equipment or software to start working with us. All you need is a reliable Internet connection, computer and you are ready to go! Many of our transcribers listen to the audio in headphones, use your favorite pair if you like. The TranscribeMe award-winning, cloud-based technology platform makes transcription addictive! 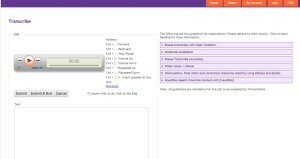 Our next generation transcription interface is the most intuitive and easy to use tool out there. Just open your Google Chrome browser, log into the WorkHub and start transcribing. With Intelligent Distribution as part of our unique technology, you will only get transcription assignments that are right for you. Our platform comes complete with state of the art transcription tools and useful shortcuts to help speed up your work. Now you can do more in less time – and see your earnings soar! Our Legal and Medical Transcriptionists require specialized backgrounds and are paid a very strong per page rate. If you are ready to become a part of our vibrant community of crowd transcriptionists, register with us by clicking on the “Join Us” button. Our informative online training program will introduce you to the interface and will take you through the Style Guide. You will be then asked to take an exam to prove you can accurately transcribe audio and follow style guidelines. Once you’ve passed the exam, you’ll be given short chunks of audio to transcribe, and you can begin earning and monetizing your downtime!